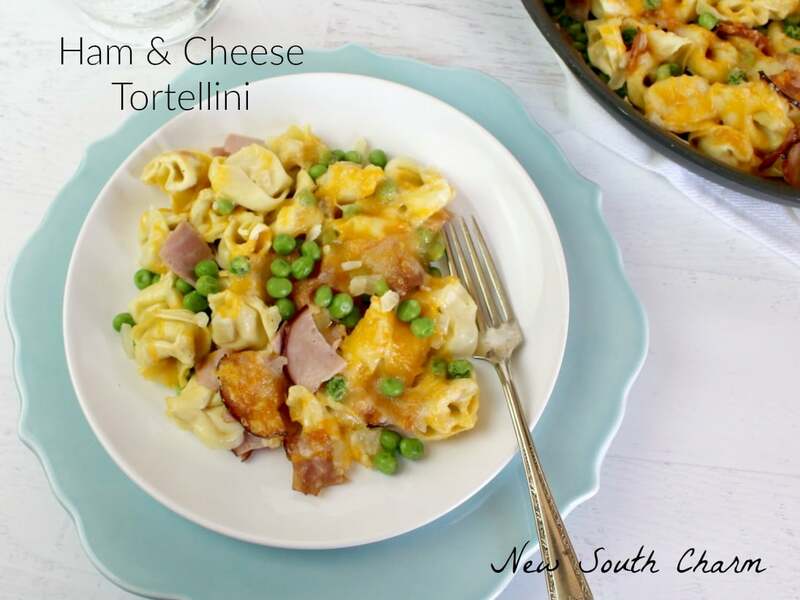 Ham and Cheese Tortellini is a rich, creamy dish that is so easy to make that you can have it ready in just 30 minutes. This recipe is great for leftover ham but you don’t have to wait for leftovers to make it. I make this recipe all the time just using a slice of bone in smoked ham from the meat section of my grocery store. I just trim off any fat and then cut it into bite size pieces. 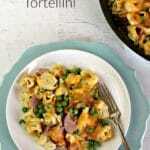 Ham and Cheese Tortellini only takes thirty minutes to make. To help cut down on prep time I use an easy shortcut: frozen chopped onions. I buy them in the freezer section with the other frozen vegetables. There’s no need to thaw them first. Just measure and toss them in frozen. They thaw quickly and will save you tons of time in the kitchen. 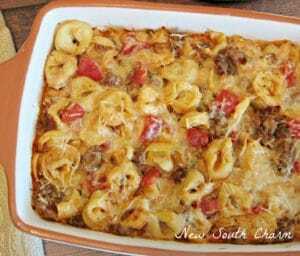 In a large ovenproof skillet melt a tablespoon of butter over medium high heat. When butter is melted add onions and cook them until they are tender and translucent. Add garlic and cook for two minutes stirring constantly. Add chopped ham to skillet and cook until it’s slightly browned. Once the ham is browned pour in the chicken broth and season with salt and pepper and Cayenne pepper. Stir to combine. 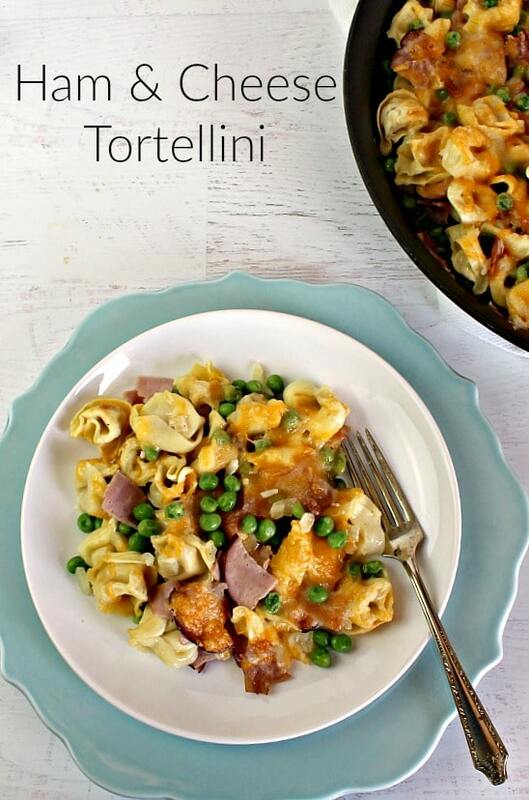 Place tortellini in the skillet and bring to a everything boil. Reduce heat and cover and simmer on low for about ten minutes or until the pasta is tender. When the pasta is cooked remove the skillet from heat and add in frozen peas. Pour in heavy cream and stir to combine. Be sure you have removed the skillet from the burner to prevent your cream from curdling. Sprinkle cheese over the top. Then pop the skillet under the broiler in your oven until the cheese is bubbly and golden brown. That’s it! This recipe is so easy to make it’s foolproof. Plus, you make it all in just one skillet so cleaning up dinner couldn’t be easier. I just love dinners like these! 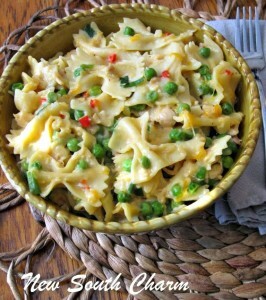 So good and perfect for some of the ham I have in the fridge right now! This looks great, and I love your dishes!! Perfect for the ham that I have left over from yesterday. This is nice a quick and in our busy lives that’s just what we need! Thanks.